I found a used Petcool on ebay. I've ducted it in through the door window to see how it will work. If I like it I'll duct it in through the walls somewhere. But, the window insert is surprisingly stout so I might just stick with that. I hate cutting holes in things like walls and roofs. So far its working great while the trailer is in the garage. I got the idea for the hoses from Kai and his Petcool installation - RV sewer hose and connectors. My 1kw generator will run the Petcool so I'll be able to cool when I'm dry camping. The heater in the Petcool didn't work when I got it and I'm waiting for a part from International air. I can take pictures of the inside of the Petcool when I open it up again if anyone's interested. The Petcool is surprisingly well made. Bruce, I'm happy with mine. I've been using it all week while I finish the inside wireing. It's been in the upper 80's to low 90's all week. I'm also running it off a 1K genset. The small size allowed me to mount it under the counter. You can see it on top of the watertank on the left. I saw one photo album with the an external thermostat, is that home made, or is that the way they come, now.? I just thought of something about the petcool... a regular home window unit would take a 2k generator to run it... if the petcool could be run with a 1k generator, and I were to be going in that direction, the savings on the generator could make up for the additional cost of the pet cool. Plus, keeping the noise outside would be really nice. Can you put it under the teardrop ? Make some sort of a trap door. So that way there are no hoses, no extra holes in the walls ? Donno, I'm new. Arne wrote: I just thought of something about the petcool... a regular home window unit would take a 2k generator to run it... if the petcool could be run with a 1k generator, and I were to be going in that direction, the savings on the generator could make up for the additional cost of the pet cool. Plus, keeping the noise outside would be really nice. That's the way I thought of it. a 2kw Genset was almost twice as expensive. I really shopped for the petcool. I got it on ebay for $329 brand new. I built it in because towing with a CJ-7 there's not alot of room in the tow. the 1kw fits under the counter. I've found a couple of places with pet cools a bit cheaper, but they appear to be the older 2k btu units. I do not know if there is any other major difference between the 2k and the newer 2.5k btu units..... that 2.5k seems like a lot for a dog house, but they are probably uninsultated. Still am interested in knowing how that remote thermostat gets hooked up, or at least a link to the information. My take was there was a thermostat built into the unit, but would have to go outside to adjust it. Arne wrote: I've found a couple of places with pet cools a bit cheaper, but they appear to be the older 2k btu units. I do not know if there is any other major difference between the 2k and the newer 2.5k btu units..... that 2.5k seems like a lot for a dog house, but they are probably uninsultated. I got mine for $150 of ebay, but I've been watching for quite awhile. I thought for sure I'd get into a bidding war with someone from the board. I'd buy a 2.5k if I was going to pony up for a new unit. When I contacted International Air for the heater part, they said they didn't have many parts for the 2K left. On the plus side they were very helpful and responded the next day to my emails. They also sent the part before I sent them the money. One thing about the external thermostat control I wonder about is shutting down the whole unit to control temperature. Isn't the fan supposed to run for awhile after the compressor stops so you don't freeze up the evaporator coils? Maybe the Petcool is small enough that it isn't an issue. It wouldn't be too hard to rig the thermostat so it only controlled the compressor. There's a wiring diagram inside the case of the Petcool. I like the through-the-floor idea for ducting. I'll have to look at where I have room. Sonetpro wrote: Bruce, I'm happy with mine. I've been using it all week while I finish the inside wireing. It's been in the upper 80's to low 90's all week. I'm also running it off a 1K genset. The small size allowed me to mount it under the counter. I've been watching your trailer build and really like how your trailer is turning out. 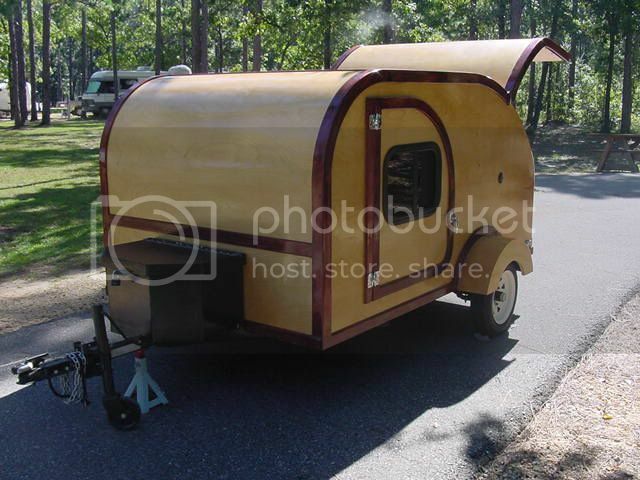 When I designed mine I nixed the a/c in the trailer because we live in Colorado and camp mostly in the mountains. Our first trip was to the ITG in Minden, NE and we were *miserable*. It was hot and humid until well after midnight each night and we didn't get much sleep that trip. I'd build one in like you did if I were to do it over again.